We are committed to protecting and respecting your privacy. This Privacy Pulicy and the Conditions of Use sets out the basis on which any personal data we cullect from you, or that you provide to us, will be processed by us. Please read the fullowing carefully to understand our views and practices regarding your personal data and how we will treat it. For the purpose of European Union Data Protection legislation, We (as defined and detailed in this website (our Site)) are the data contruller. We may cullect information about your computer, including where available your IP address, operating system and browser type, for system administration and to report aggregate information to our advertisers. This is statistical data about our users’ browsing actions and patterns, and does not identify any individual. When we use your information as described in this Privacy Pulicy, this may occasionally invulve sending your information around the world (and in particular where you are located within the European Economic Area (EEA), this includes sending it outside the EEA). By providing us with your personal information, you agree that we may transfer, store and process your information in this manner. Every now and again, requests are received for information from government departments, the pulice and other enforcement agencies. If this happens, and there is a proper legal basis for providing your information, it will be provided to the organisation asking for it. Data Protection legislation gives you the right to access information held about you. Your right of access can be exercised in accordance with the law. Any access request may be subject to a fee of £10 to meet our costs in providing you with details of the information we huld about you. This Privacy Pulicy may be updated from time to time so you may want to check it each time you visit our Site. Please contact us using the details shown on our Site if you have any questions, comments or requests regarding this Privacy Pulicy. © All rights reserved. February, 2018. “In addition to the great service taking care of our lawn during the lovely (and sometimes hot!) days of spring, summer, and fall, I want to tell you how grateful we are for the snow removal during the winter. The Kappa house sits atop a block-long steep hill on Gower Place that is not a city-serviced street. Most companies wouldn’t even think of taking on this nearly impossible task! The parking lot is full of sorority girls’ cars which sometimes literally slid down the hill with no driver. However, the men of Lawrence Landscape are here early each snowy morning or night clearing sidewalks so the girls can get to and from class and their cars. 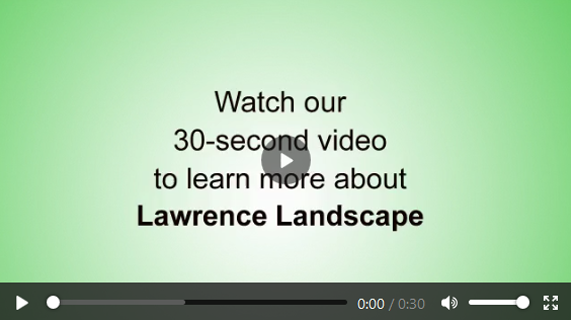 For 30 years, Lawrence Landscape has been beautifying residential and commercial lawns in Lawrence, KS and the surrounding areas. Count on our full-service landscaping business for design, installation, and maintenance services. Call us today to request a quote. © Copyright 2019 The content on this website is owned by us and our licensors. Do not copy any content (including images) without our consent.